Amateur foodie in search of those awesomely crispy shoestring fries or that spice rubbed meat that melts. Delicious bites are the way I catalog my experiences. This entry was posted in Dessert, Holiday and tagged boozy dessert, rum, rum cake, thanksgiving, whipped cream on November 7, 2013 by Claire Webb. I look forward to football season more and more. With it comes a welcome cooling trend from the summer heat, festive weekends and, of course, addictive snack foods that go best with sports. I don’t know all the stats or follow the majority of the games, but I’m just as happy being along for the ride (and around for a lot of the food). For a recent UW game, I decided to change up the usual chips, burgers and hot dogs for some good ol’ fried chicken. This entry was posted in Dinner, Mains and tagged Chicken, Football, Fourth of July, fried chicken, Tyler Florence, Wayfare Tavern on October 22, 2013 by Claire Webb. So, I know it’s been a while, and a few things have happened since I last posted the Arnold Palmer cake. I moved to Seattle, upgraded to a rustic French kitchen and now have my very own Kitchen Aid mixer (more on my love affair with this later). Life is good and I’m ready to dust off my gear and get cooking again. This entry was posted in Appetizers and tagged bruschetta, cherries, pickles, Witches of Eastwick on September 10, 2013 by Claire Webb. When I’m presented with a fruity confection and a flourless chocolate cake on a dessert menu, I will almost always choose the latter. My attitude about dessert is, if I’m going to go for it, I want it to taste rich and satisfying. These cakes delighted me with how much flavor they had for what I might have considered a dainty dessert. 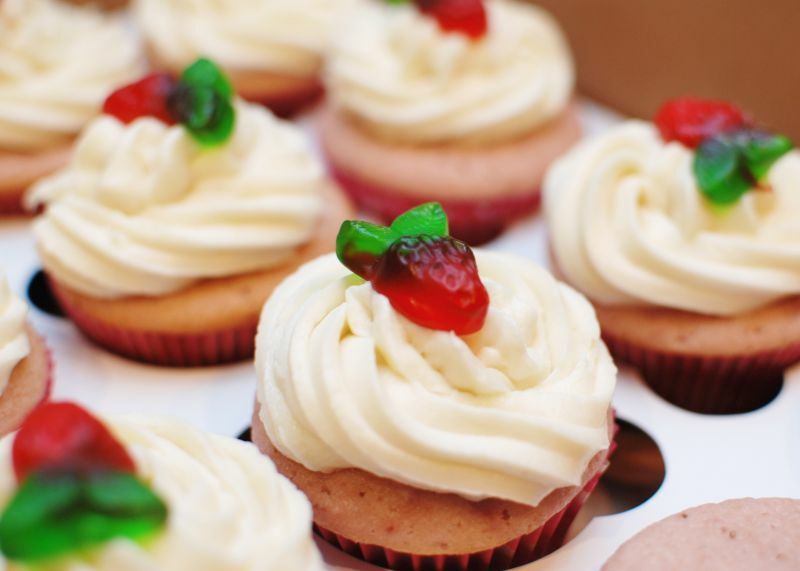 These cupcakes would be ideal for impressing a crowd at your friend’s baby shower. 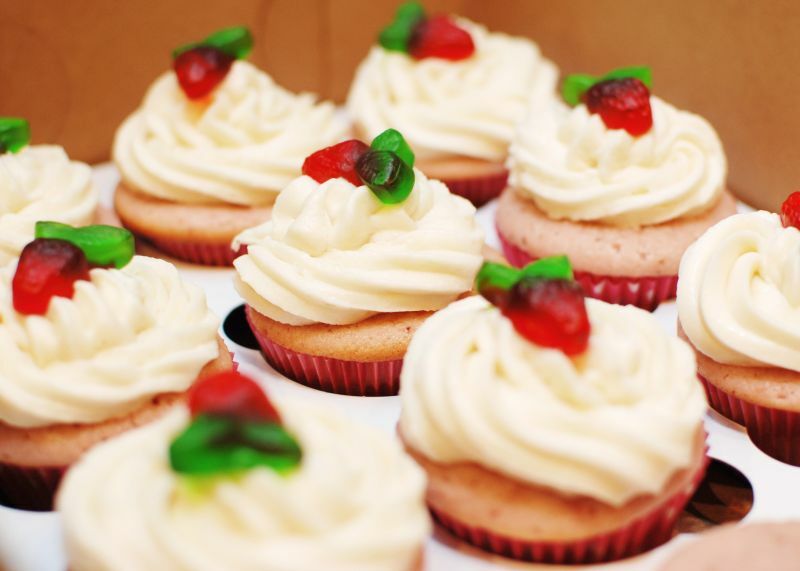 I’d pair them with lemon meringue cupcakes and just sit back and watch your guests swoon as they circle the cake stand. Conversely, they would satisfy the dessert craving of the rib eaters at your Fourth of July BBQ. I took them to a Memorial Day party and I wasn’t finished explaining what they were before two had been plucked from the box. If you want to make an impact with a dessert that is unexpected, flavorful and is completely doable at home (even for the boxed cake cook), this is it. 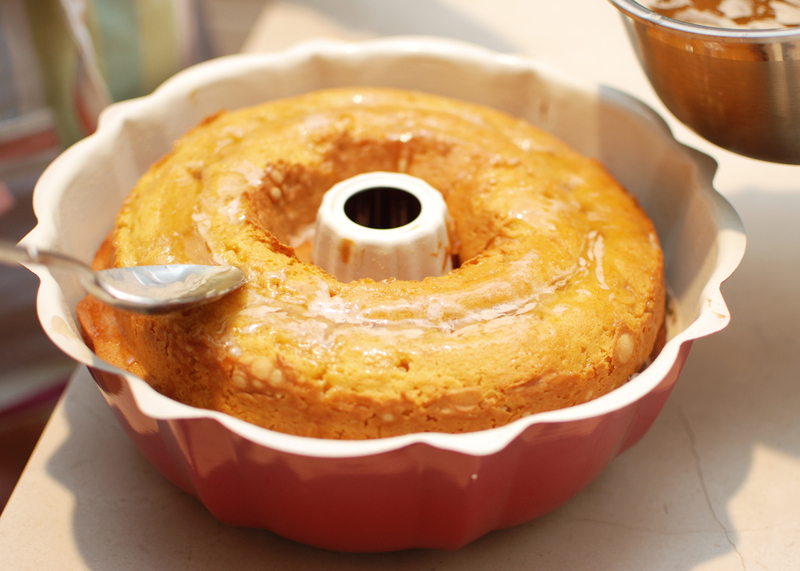 This recipe is originally a Smitten Kitchen cake recipe that Deb Perelman adapted from one of her favorite cookbooks, Sky High. She used it for a pretty princess birthday cake, which I’m sure would be fabulous, but I decided to make them into individual cakes. Ina Garten maintains that adults are just like children when it comes to desserts: they want their own and they don’t want to share. I’m inclined to agree. This isn’t to say I don’t love a great big slice of cake, but these just seemed appropriate for the Memorial Day potluck I was headed to. If you’re inclined to think these are a little too cutesy for mixed company, just know the depth of flavor really balances the girly factor. Some fruit cakes try too hard to be light that they can end up tasting like the whipped air version of the original fruit. But this cake and frosting combination is like that solid strawberry shake (the kind with little bits of berry still intact) that would make you return to the burger joint. 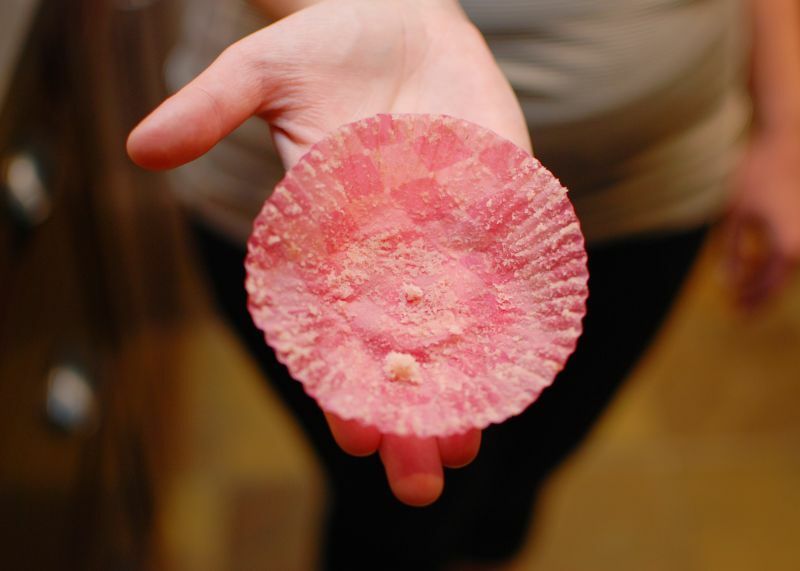 It has a richness that fills the small space of a cupcake wrapper. 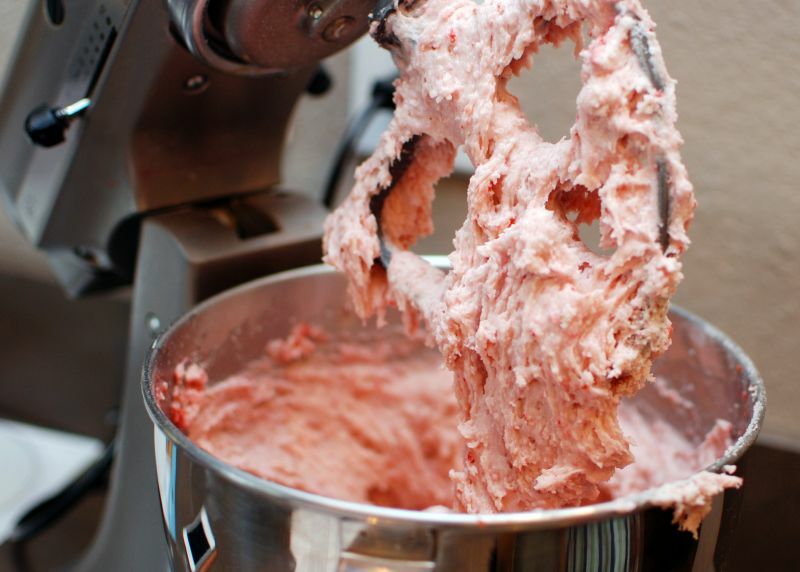 A word to the chef: this recipe is a departure from the usual cake baking process because it tells you to combine the butter with dry ingredients and strawberry puree, rather than creaming the butter and sugar first. I didn’t understand the reasoning behind this at first, and I’m not sure I do now, but it works. Just go with it. And listen to the warning from Perelman to resist eating the batter in its pre-baked stage, you may not be able to stop yourself from stealing more than one spoonful. 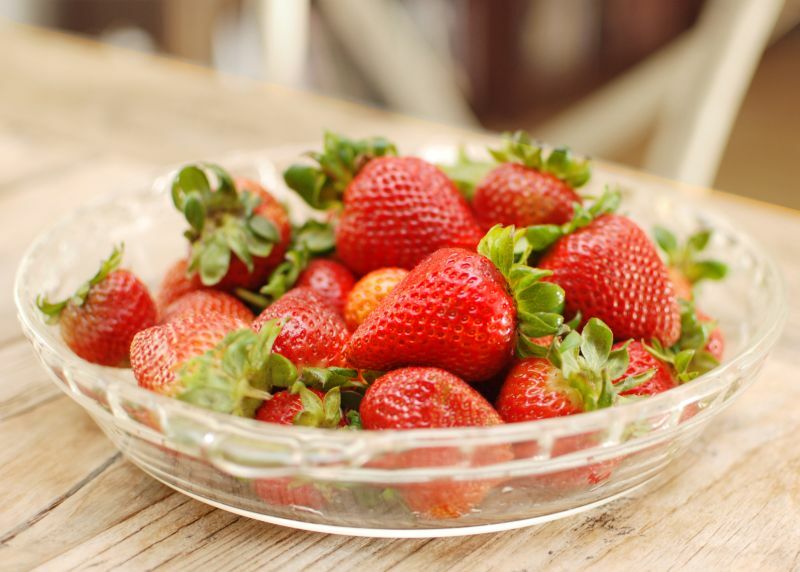 The recipe calls for frozen strawberries, which is great to know because they are so accessible, but I used fresh strawberries and found the flavor was bright, and the color was vibrant. 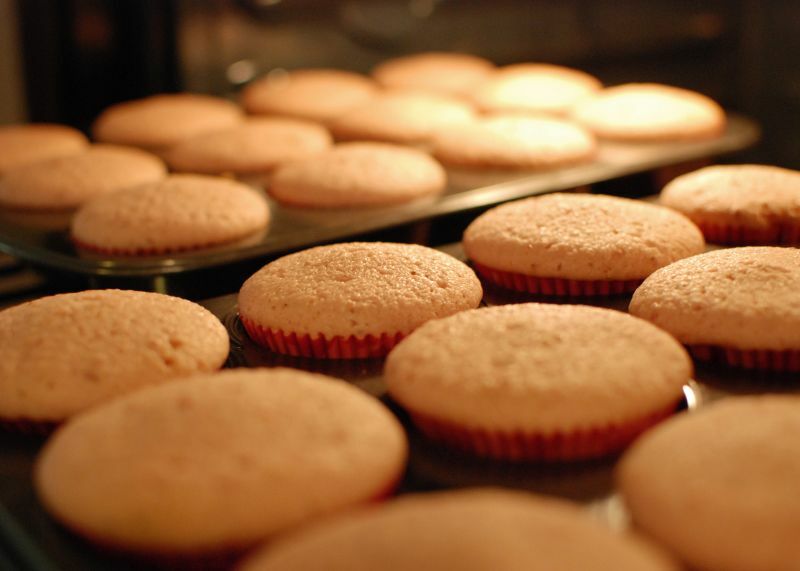 A word on the icing. 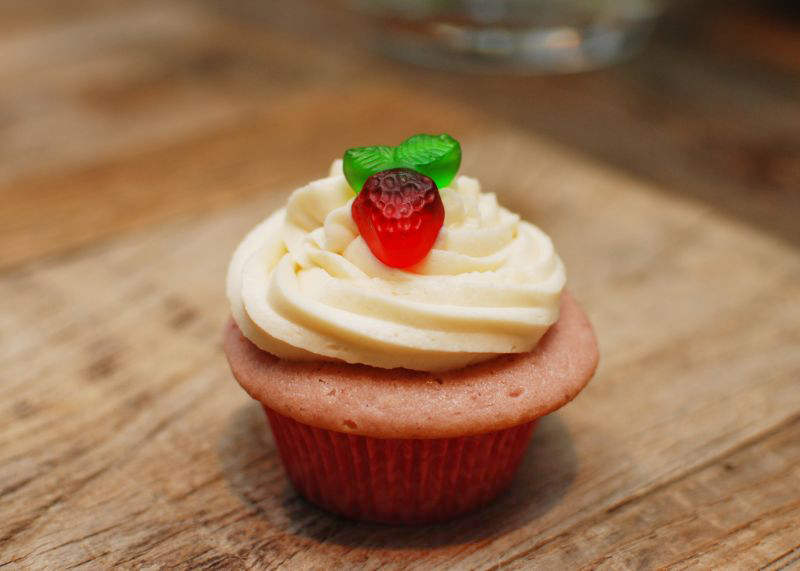 I’m a big fan of cream cheese icing, especially when you want to achieve that rich but light quality for a dessert. This frosting really exceeded my expectations because it was only slightly sweet and didn’t taste like it was made of butter. The layer of icing really didn’t overpower the airy strawberry flavor of the cake, and I think it’s because the recipe is heavy on the cream cheese and easy on the butter and confectioners sugar (relatively speaking of course). 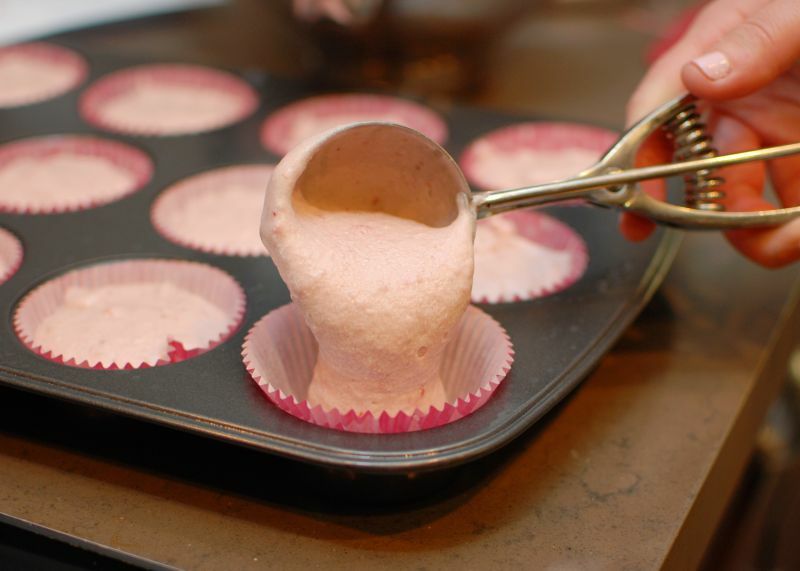 I piped this icing using a star tip, but you can also spread the frosting and top with sugary items that strike your fancy. For me those were the strawberry gummies at the grocery store checkout. If you decide to make the cupcakes and transport them to your next party, I suggest investing in boxes like these so all your icing labor doesn’t go to waste. I bought a pack of 10 and I would buy them again because they have the cardboard cup holders, and just make anything you put in them look professional. Let’s face it, in cooking, as with many things in life, presentation is important. This entry was posted in Dessert and tagged baby shower, cupcakes, pink cake, Smitten Kitchen, strawberry on June 4, 2013 by Claire Webb. I’ve read that chefs who can make a truly addictive vegetable dish that makes you want to forgo meat (that is, if you like meat in the first place) have a special kind of culinary imagination. Sure, anything you add bacon to is going to taste good, if not transcendent. But it’s what you can do without the duck fat, rib eye steak and fried chicken bits that can really set you apart. I’m starting to believe that more and more, especially when I come across dishes like this. Last month my two sisters and our close friend went to Chicago together and had some memorable food experiences. They recapped almost every restaurant excursion for me, but the one dish they kept mentioning over phone, text and email was the Magic Beans at Top Chef Winner Stephanie Izard’s Girl & the Goat. Next on my vacation wish list is definitely a long, expensive food weekend in Chicago with stops at Alinea, Next, The Publican and of course, Girl & the Goat. I considered not making these beans for about four seconds, in a fit of “you left me behind to have all this amazing food” rage, but I’m so glad I came back to reality. They were stop eating and steal the plate of beans good. 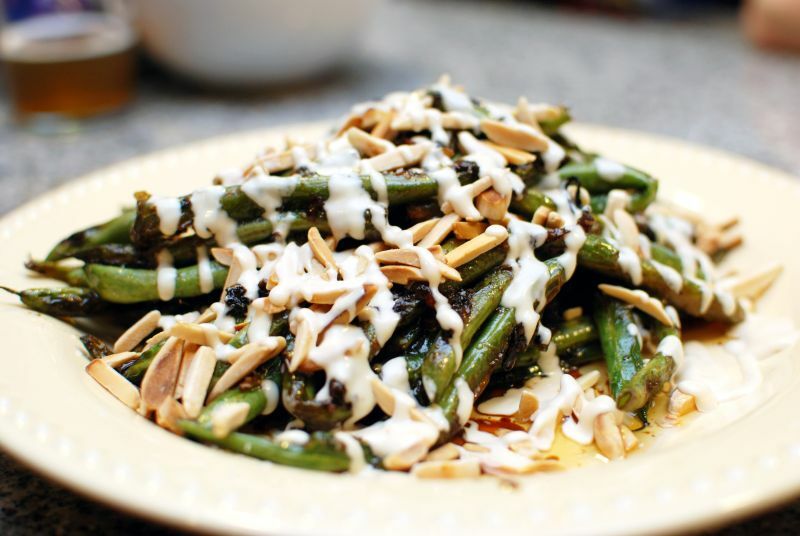 Essentially, these are blistered green beans cooked with shallots, tossed in a briny, soy, garlicky, crack-like sauce, then topped with aioli and toasted nuts. 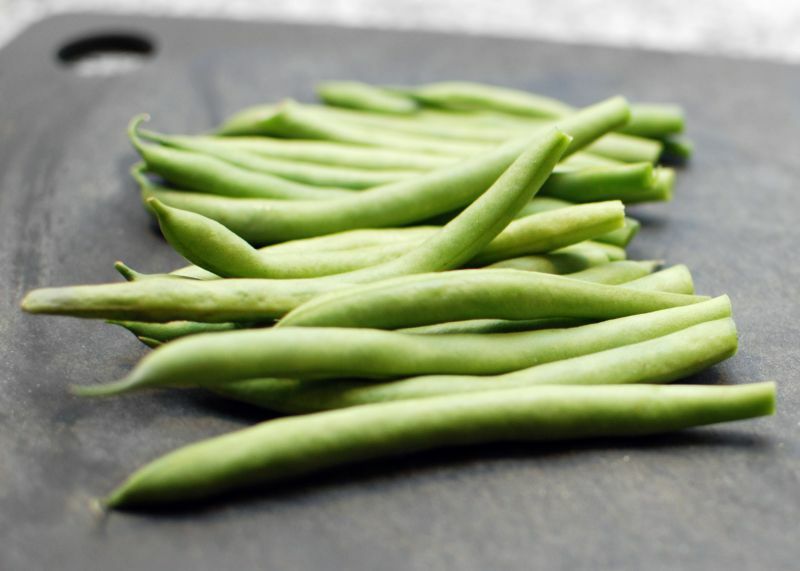 Now, if you didn’t read all that and immediately add green beans to your shopping list, please trust me on this one. But I warn you, serving these will draw attention away from whatever else is on the plate. I made sure to have our friend Lisa (one of the Chicago travelers) over to dinner the night I attempted these for the first time, to see if my re-creation was on point. She said they were just as magical, and the pile of beans was gone before we finished our turkey burgers. Izard says to use cashews here, but I liked the look of slivered almonds with the beans, and I thought they complemented the flavors well. I had quite a bit of extra dressing and aioli, so I used the aioli later in the week as a dipping sauce for artichokes. I’m pretty sure it would make anything extremely addicting, so don’t let it go to waste. Blend lemon juice, fish sauce, soy, dijon and sriracha and garlic. Once smooth, pour in canola oil in a steady stream to emulsify. Whisk together green bean dressing and mayonnaise to make aioli. Set aside. Heat a couple of tablespoons of canola oil in a frying pan, just enough to coat the bottom. When the oil begins to shimmer, add the green beans. Toss for a minute or two, then add the shallots. Once the skin of the beans has started to blister, add a half of a cup of the vinaigrette to the pan and let the beans steam until they are tender. 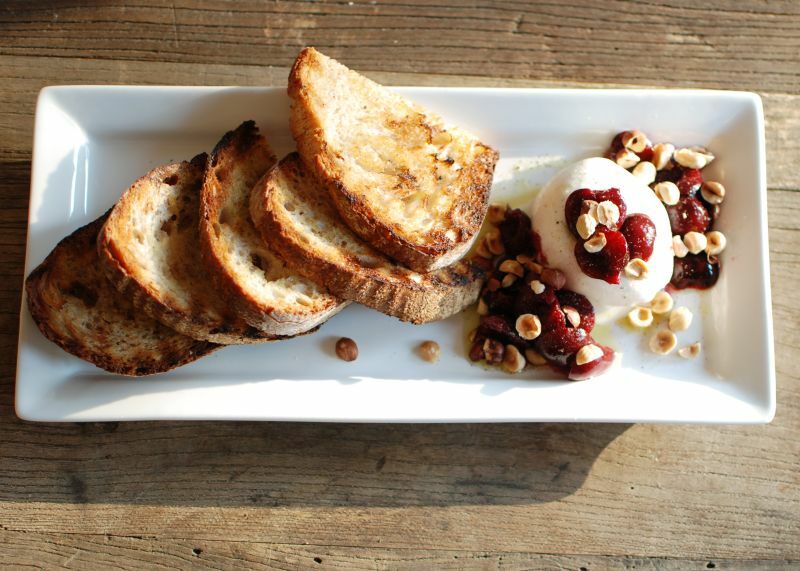 Transfer beans to a serving platter and top with toasted nuts. Drizzle with aioli and serve hot. 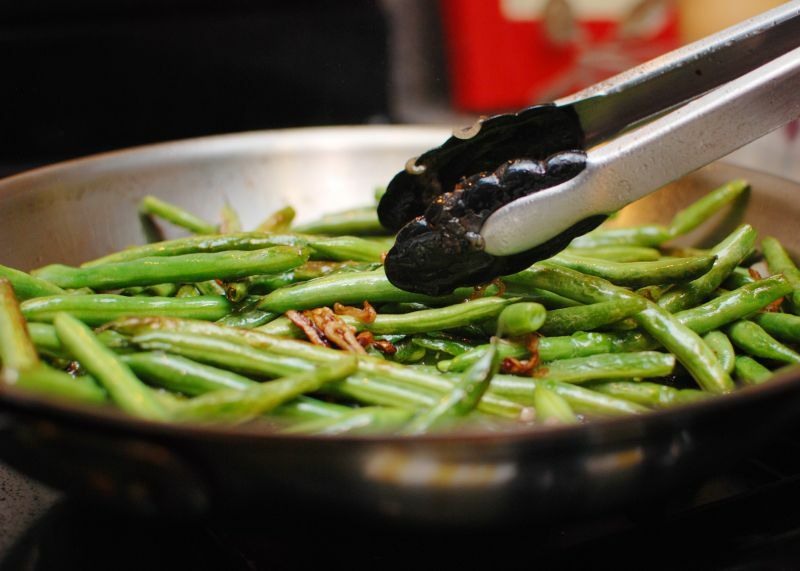 This entry was posted in Sides and tagged addictive veggies, green beans, top chef on May 29, 2013 by Claire Webb. Tomorrow I am planning an epic day of cooking with my older sister. We have a list of freeze-capable recipes we are making for a friend, who is about to have twins and will most likely need a stockpile of meals. Because I don’t think we will be doing the traditional BBQ activities, I made these turkey burgers this week to put me in the festive mood for the Memorial Day weekend. This first burger appearance on the blog is not meant to suggest that I always prefer turkey over a luxe combination of beef products. I’m a true lover of the beef burger arts. I don’t often make burgers at home, but when I do, I prefer turkey (insert Most Interesting Man in the World Meme). I’ve made plenty of turkey burgers, meatballs and meatloaves in my day, and I’m keeping these burgers in my repertoire because they have the optimum levels of spice, heat and bite from the onions and garlic. They are awesome for a weeknight dinner, weekend BBQ and the patties freeze well when wrapped tightly in plastic. I used the 93 percent lean turkey because I think even turkey burgers need a bit of fat to be flavorful, but you could use the ultra lean stuff is you like. 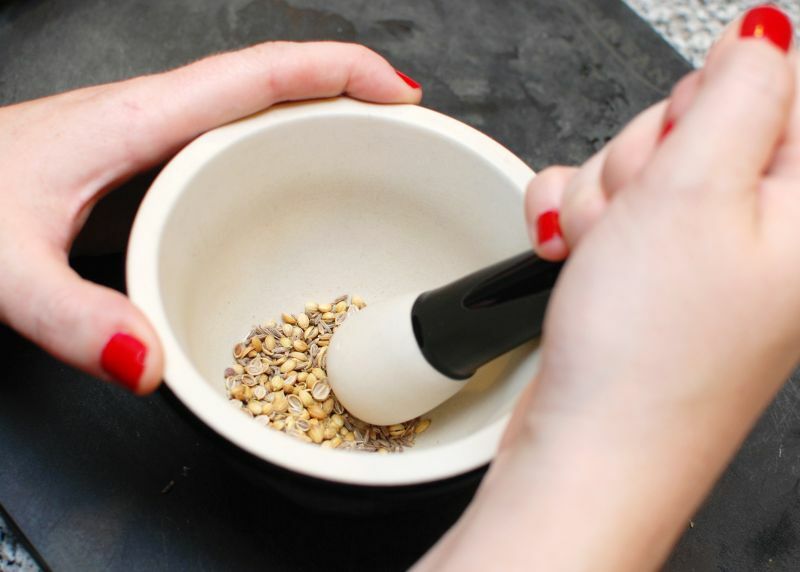 I also used whole spices that I ground with a mortar and pestle first, a step that may seem fussy but I think adds much more smokey flavor. 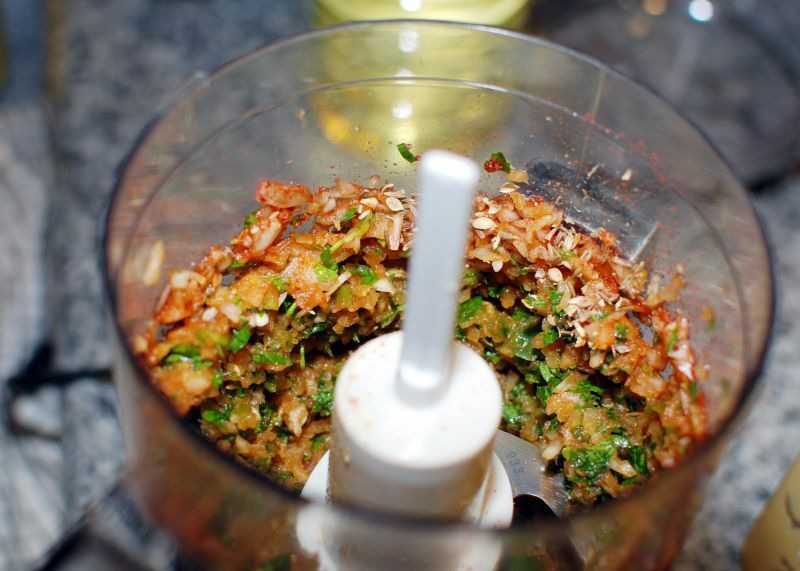 I like to chop all of the burger-enhancing ingredients in a food processor, because I like how the onions, garlic, peppers and spices become so fine that they blend into the patty. No big chunks of onions here. You can of course chop these ingredients by hand, just make sure to take a little extra time to make the pieces very small. For toppings, I use a fat-free black bean dip from Trader Joe’s, red onion, sliced tomato and arugula. I really like how the tangy bean dip compliments the smoky spices and cilantro, and also adds some moisture to the final product (since turkey burgers have a tendency to become dry). These burgers would also be great with some pickled red onions, avocado and chopped spinach. Enjoy the long weekend! Combine onion, garlic, jalapeño or serrano chile, cilantro, coriander, cumin, paprika, and black pepper in a food processor. Pulse until the onions are finely chopped and the ingredients are incorporated. Add the vegetable and spice mixture to a bowl with the ground turkey and use a fork to combine. Form into patties about the size of your palm. Season with salt and pepper. Grill patties over medium-high heat for about 5-7 minutes per side, until they are cooked through. 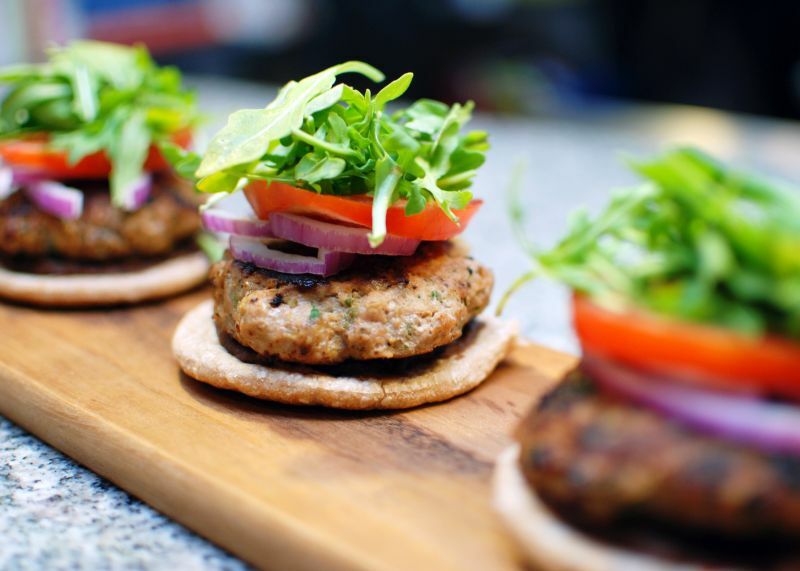 To finish the burgers, lightly toast the mini pitas and spread a tablespoon of black bean dip on each one. 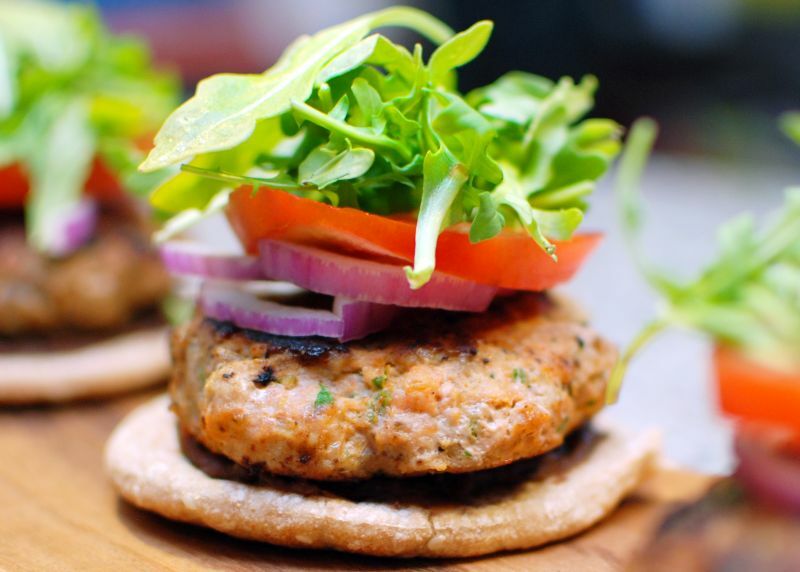 Place a burger patty on each pita, and top with red onion, tomato and arugula. Serve immediately. This entry was posted in Mains and tagged burger, Memorial Day BBQ, turkey burger on May 24, 2013 by Claire Webb.